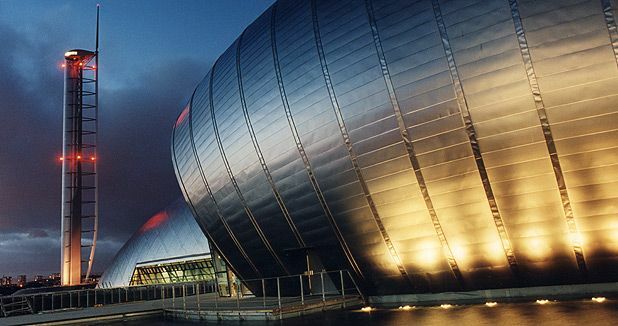 The Glasgow Cineworld IMAX was the first of its kind north of the border, and it received a major upgrade in 2013. The new 62' x 82' screen is the biggest cinema screen in Scotland, and a new digital projection system allows a larger variety of content to be screened, from the newest blockbusters to educational material supporting the Glasgow Science Centre's schools programme. A Starbucks has been added, with views across the Canting Basin. In the future, Cineworld plans to install its next-generation laser digital projection system. The nearest train station is Exhibition Centre (Argyle Line), located across the river on the other side of SECC – cross the motorway using the covered walkway. Cessnock subway station is just under a mile away on Cessnock Street, south of Festival Park. The nearest bus stops are First Bus 90 on Paisley Road West; McGill's 23 & 26 on Pacific Drive; and the City Sightseeing tour bus on Pacific Quay. Public car parking is available at Concert Square car park, opposite the cinema, or you can use the GSC pay car park (£3/day.) For sat nav, enter the postcode: G51 1EA.